This past Saturday gave us a glimpse of greatness that has passed. The talk is starting to roll, and even the professionals are questioning the motives of Rachel Alexandra. Andy Beyer was quoted in the Washington Post as saying that “her glory days are over.” The Personal Ensign Stakes showed us that she will continue to give her best. I know that the streak, or the roll cannot live forever… But, there does come a time that things do end…. She was Horse of the Year, and beat the males in the Woodward. She gave us exciting action, and did it like very few others could. But it is over… Wouldn’t you like to see her babies for years to come? I sure would, and it hurts me to watch her give her all and it gets a little less each time. She is special, and it is time to head into the shed as a champion…. There comes a time in every athlete’s life when you hang it up. How many times have we seen humans stick around too long? We don’t want it to turn into the Brett Favre show, where we wonder if she is going to hang it up. I can say that I saw her. I will remember her for my life as a racing fan…. But, it is over and I think we all know it…..
G1 yet I don’t see you calling for his retirement. Or Mine That Bird ,Christine Daae, Forever Together, Havre de Grace, I Want Revenge, Informed Decision, Loup Breton, St Trinians, Tres Borrachos, Unrivaled Belle, Zaranda and many other good if not elite horses that have failed to win a G1 this year. If we retire all horses that have not won a G1 this year, how will the races fill? Bottom line your article stinks, anybody can put up a blog with their opinions but that doesn’t mean the writer is correct. I’m sure glad you don’t own her or any other top horses, there would literally be no races to watch with your attitude of quick retirement. My blog is an opinion…. There is no right or wrong, just as you have thougts. You have a few ideas about runners that need to be retired, and that doesn’t stink… It is your opinion. I have loved watching her. I just want what is best for her. Is it over ?? Where should they go from here ?? – Did you see Quality Road, Blame, or how Zenyatta is coming up ?? Is she ready ?? – I would love to see her babies for years to come. Maybe Curlin in her future ?? – Just a thought …. Only time will tell, and we will see what the owners want to do. 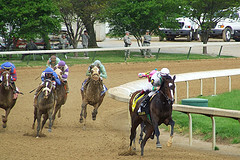 But, I saw that picture on the front of the DRF, and Asmussen didn’t look so sure. It looked as if he had doubts for the first time. If she is ready, fire away… If not, then don’t waste a beautiful animal….. Thanks, and good luck !! Nah, the look on their faces was typical after a loss. You don’t race to lose, you race because you think you can win. Did you see the look on Pletcher’s face after Quality Road was beat by Blame? Same look. She may or may not be able to handle 10f, the Personal Ensign in my opinion failed to answer that question. The BC is at CD and the track isn’t nearly as tiring and deep (cuppy) as Saratoga’s. I’d not rule out the Classic for her, though it’s more likely and makes more sense to run in the Ladies Classic. At this point she can still dismantle nearly all of the top fillies, why think about retirement? If I owned her I’d increase her works to get a stronger base in her before running in the Beldame. Then I’d go on to the Ladies Classic. As you said, it’s all opinion and there is no right or wrong. You both make valid points. She could be tailing off But I think she has one more in her. I would retire her after the breeders cup. Zenyata will be vulnerable after the change of scenery and the dirt. I know she won twice on dirt at oaklawn but she faced nobody in either race. She has faced mediocre competition in many of her races. The classic last year was weak in my mind as well. Blame will win the classic and Horse of the year. I dont think he will get beat I dont think he remembers how to get beat. He reminds me of ghostzapper. The breeders cup should be ran on dirt. Poly should only be used in cold weather states that lose many dates. I dont think Rachael should run in the classic its far to long for her. I am glad that Rachel is retired. She gave us a show that we will carry for a long time…. I can’t wait to see the first Curlin / Rachel baby hit the track ! !